Kichijoten, Nara period, Yakushi Temple, Nara. Monochrome pottery, cord-impressed designs (Jomon) and lacquer objects. Painting in this period emulated Chinese T'ang prototypes. Tokiwa Mitsunaga (ca. last half of the 12th century) Narrative Handscrolls. Josetsu (如拙) (1405 – 1423), the father of Japanese ink painting. Kanō Eitoku (狩野 永徳) (1543 - 1590), prominent patriarch of the Kanō School. 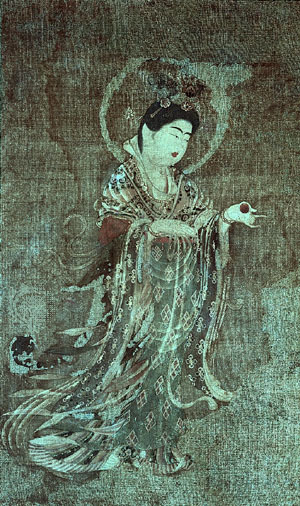 Tawaraya Sōtatsu (俵屋宗達) (c. 1600s), co-founder of the Rimpa School. Hakuin Ekaku (1685-1768), had a profound effect on Zen painting. Maruyama Okyo (1733-95), the founder of the Maruyama-Shijo school of naturalist painters in Kyoto. Katsushika Hokusai (葛飾北斎) (1760 — 1849), Ukiyo-e (浮世絵) genre painter and printmaker. "Behind the Great Wave at Kanagawa" (c.1829) is one of the most renowned Japanese paintings. Shoen Uemura (1875-1949), female painter. Taikan Yokoyama (1868-1958), member of the samurai class of the Mito clan. Yuki Ogura (小倉遊亀) (1895 - 2000), traditional female painter. Shinoda Toko (篠田桃紅) (b. 1913), female painter, sumi (ink) paintings and prints. The Illustrated Sutra of Cause and Effect, 8th century. Sakai Hoitsu, Autumn Flowers and Moon, ca. 1800. Tawaraya Sotatsu, Wind God and Thunder God Screens, ca. 1600s. Lakeside by Seiki Kuroda, ca. 1848. Maiko by Seiki Kuroda, ca. 1920. I pray with all of my love for tulips, installation by Yayoi Kusama. This page was last modified on 19 January 2015, at 21:08. This page has been accessed 13,851 times.